Jean Paul Lemieux is known for his solitary figures, often placed in front of immense, horizontal landscapes. 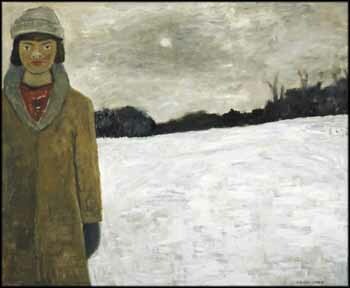 In this painting, a woman stands in front of a wintry backdrop, bundled in a heavy woolen coat and a toque. The slight blush on her cold cheeks and her red sweater add the only colours that break the monochrome of the winter landscape. Unlike the passive figures in Lemieux's earlier paintings, this woman meets the viewer's eyes with a subtle expression of resignation, perhaps directed towards the long winter. Despite this, her position in the foreground makes her appear to pull forward from the landscape and encroach into the viewer's space. Is she attempting to draw us in? Or is she warning us against the chill of a Canadian winter? Like many of Lemieux's works - and the man himself - this painting is sensitive and contemplative and, perhaps, a touch melancholic. She is a solitary being in a large world, watching the movement of time - in effect, a portrait of Lemieux's inner self.